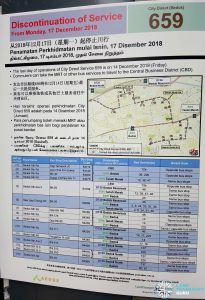 City Direct Bus Services 658, 659, 662, 664 will be discontinued from 17 December 2018. The last day of operations for these services will be on 14 December. First introduced in 2013, City Direct Bus services provided direct connections between home and work. 22 of such services currently exist. The high operating costs of these bus services were thrown in the spotlight in 2017, where 6 City Direct Bus Services were transferred from private to public bus operators, citing high bid prices of private bus operators. Private bus operators incur higher operating costs as compared to public bus operators due to their smaller economies of scale. In 2017, Bus Services 653, 656 and 657 were taken over by SMRT Buses, Bus Service 655 was taken over by SBS Transit, while Bus Services 663 and 665 were taken over by Tower Transit. These bus services are popular and are usually fully seated, but charge Express fares slightly under $3, which is significantly lesser than that of Premium Bus Services. 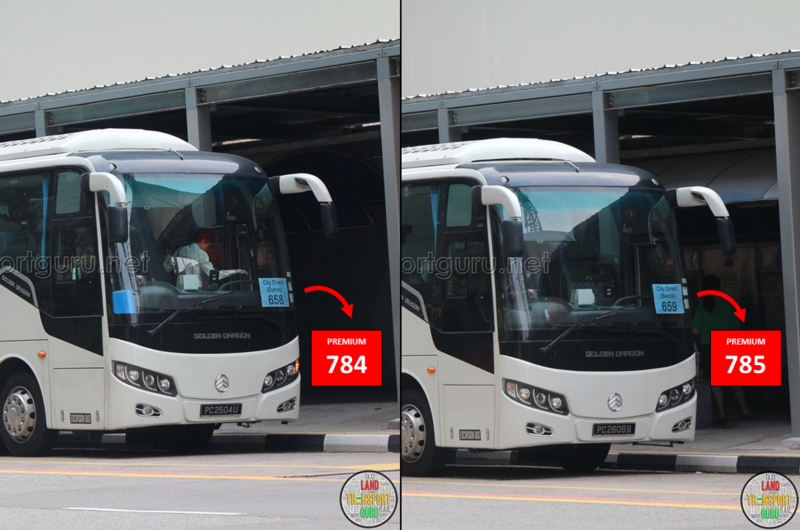 It is currently unknown why these 4 bus services were discontinued instead of being transferred to public bus operators. 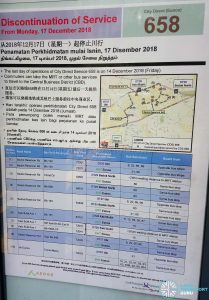 Posters informing commuters of the discontinuation of these services were first found on bus stop poles at affected bus stops on 17 November 2018. 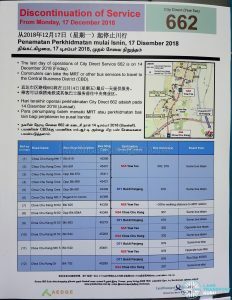 All four withdrawn routes were operated by Aedge Holdings Pte Ltd.
On 17 December 2018, Aedge Holdings introduced Premium Services 784 and 785, intended to replace City Direct services 658 and 659 and following identical routes. Only morning trips towards the CBD are offered. 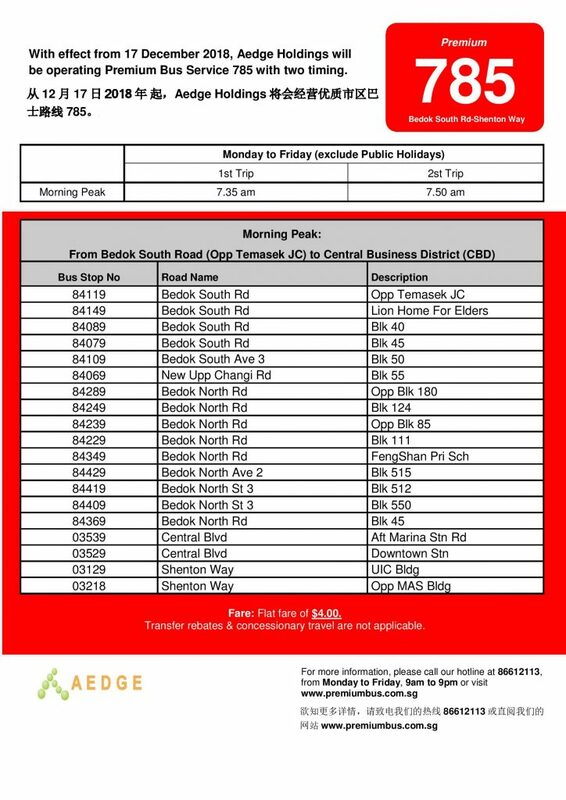 For Premium 784, one trip is operated at 7.45am, in place of two AM Peak trips of City Direct 658 at 7.40am and 7.55am. For Premium 785, two trips are operated at 7.35am and 7.50am, in place of three AM Peak trips of City Direct 659 at 7.30am, 7.40am and 7.50am. Both services charge a fare of $4, which is an increase of over a dollar as compared to regular express fares. 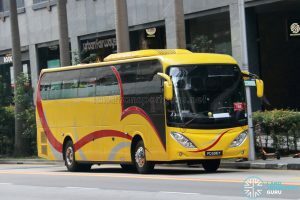 In January 2019, YZ Transport Service introduced Premium Service 786, intended to replace City Direct service 662 following a similar route. Both morning peak and evening peak trips are offered. 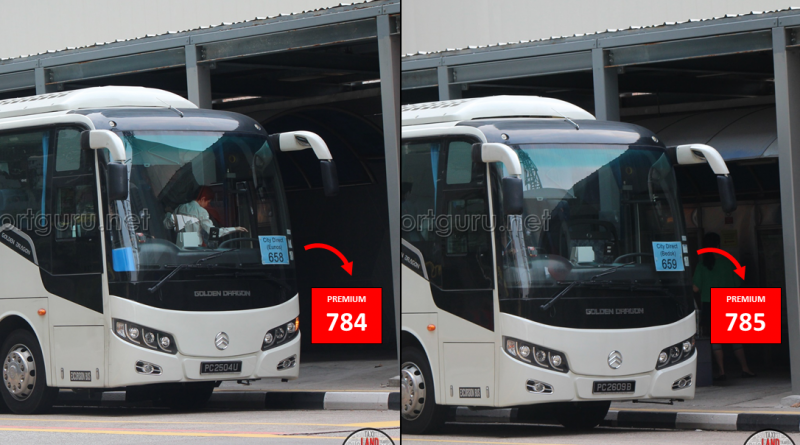 For Premium 786, two morning trips are operated at 7.30am and 7:45am, and one evening trip at 6:15pm. 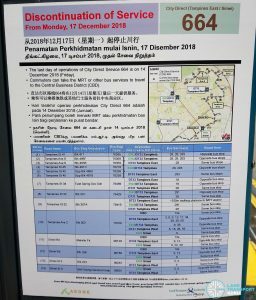 In January 2019, Ren Quan Transport introduced Premium Service 787, intended to replace City Direct service 664 following a similar route. Both morning peak and evening peak trips are offered. 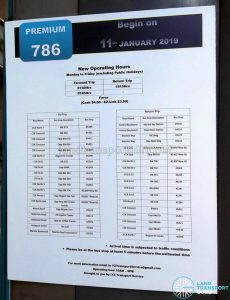 For Premium 787, two morning trips are operated at 7.30am and 7:45am, and one evening trip at 6:20pm. 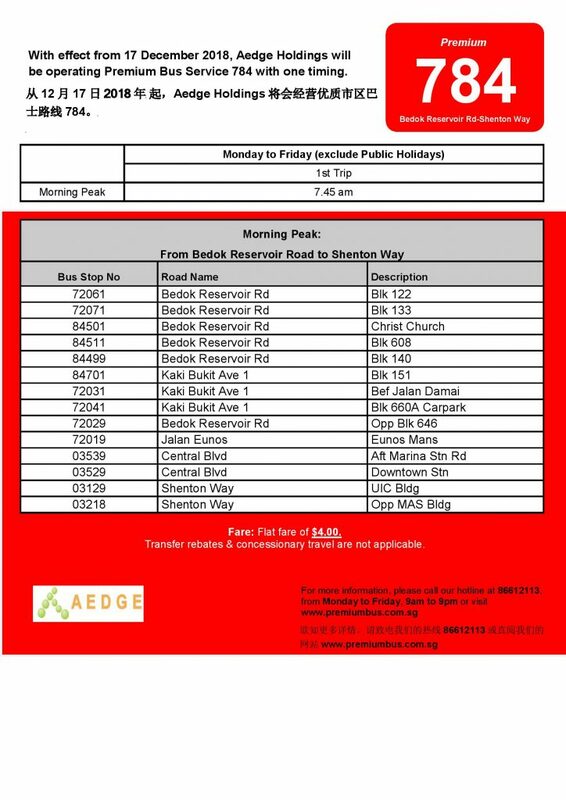 Saw bus 785 at bedok. But couldnt find the route. Anyone know? Its probably also not worth just buying additional buses and resources just to run for a couple of weekday morning trips for CDS. off peak and weekends already got many buses idling inside the depots. Why not just let pte bus operators operate these route themselves, set their own fares and keep the fares themselves? Interestingly enough, they are all run by Aedge. Why can’t 662 be run by SBST and the others by GA? Low ridership. Duh. As in, the demand is not there. And the operators are running at a loss. This is the right move by the government. DTL3 and the amendment of service 979 might have caused the fall in ridership for these 4 CDS.